Convection is the process in which a liquid or gas is cycled from a warm area to a cool area, and visa versa. It is one of the primary forms of heat transfer in our world, and is responsible for major patterns in our atmosphere, oceans, and even in the Earth's mantle! 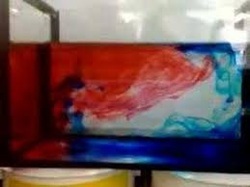 To perform the experiment, you will need a cake pan, something to set the pan on so there is room below it, three small candles, a bag of ice, red food coloring, and blue food coloring. To begin, fill the pan 3/4 full with water. Place the bag of ice in one end of the pan. Place the three small candles under the opposite end of the pan. Light them. Wait five minutes for the candles to heat the water above them and the ice to cool the water around it. After five minutes are up, squeeze four drops of red food coloring into the water above the candles. Immediately squeeze four drops of blue food coloring near the bag of ice. What do you notice? Does the hot water (red) travel along the top or bottom of the pan? What about the cold water (blue)? Why do you think that happens? First, make sure you have everything you will need: a plastic comb, some hair to run it through, and a sink. Next, turn on the faucet so that there is just a small, but steady stream of water coming out of it. Run the comb through your hair several times. Once you've done that, slowly move the comb near the water. It should be about 3 to 4 inches below the faucet and approximately 1 inch away from the stream. What happens? Why does it happen? Do you think you will get the same results if you use more water? Comb your hair more times? Place the comb further away from the water? Experiment! Yep, I said "Dancing Raisins." For this experiment you will need raisins (preferably fresh), a tall glass, and a colorless soda, such as Sprite or 7-Up. Once you've gathered your materials, count out six or seven raisins. Then, pour the soda into the glass. Drop the raisins into the soda. Do they sink or float? Keep watching. Now what are they doing? Why are they doing that? Would the same thing happen if you put something else in the soda? What if you put raisins in water?